Air India on Tuesday announced that no work, no pay principle will be implemented to counter the pilots' strike that continued to disrupt its flights for the seventh day, as the Delhi high court rapped both sides for their adamant attitude and failure to resolve the crisis. "We are implementing 'no work, no pay' against all those who are not reporting for duty. 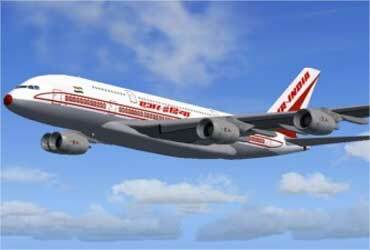 Their April salary will not be processed if they do not join work", an Air India officer said. The officer, who requested anonymity, said the company was making efforts to garner resources to pay the salaries to the rest of the employees. Bank loans were also being organised, he said. 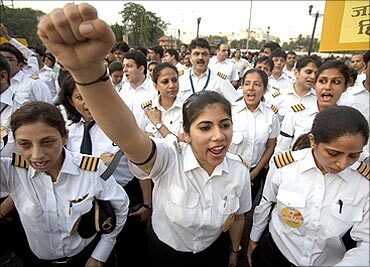 Image: Air India pilots during a protest in Mumbai. The flight operations of the national carrier continued to be disrupted for the seventh day today with the striking pilots refusing to budge saying they would call off the stir as soon as the management assured the Delhi high court that their demands would be considered within a time-frame. The court rapped both the airline management and the pilots' union, Indian Commercial Pilots Association, for their rigid attitude and appointed an amicus curiae to assist it in resolving the stand off. Image: Maharaja logo on the Air India ticketing counter. "It seems that you are also not interested in getting the strike called off," a division bench headed by Justice B D Ahmed told Lalit Bhasin, the counsel for the Air India management. The two-judge bench also appointed senior lawyer Siddharth Luthra as amicus curaie 'to assist us on the legal issues'. The ailing national carrier is flying only about 35-40 flights each day, as it has blocked domestic bookings for the past five days. 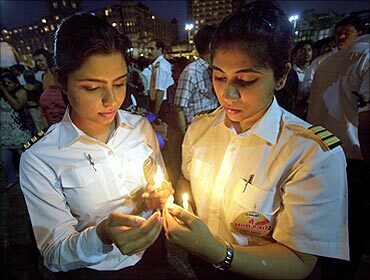 Image: Pilots during a candlelight protest in Mumbai. According to official estimates, private carriers were flying about 15,000-16,000 of passengers of AI, which is offering only about 9,000 seats each day. The airline has drastically slashed its domestic services by nearly 90 per cent operating only 40 of its 320 daily flights. "We will await the high court's order on the contempt proceedings and abide by it. .... 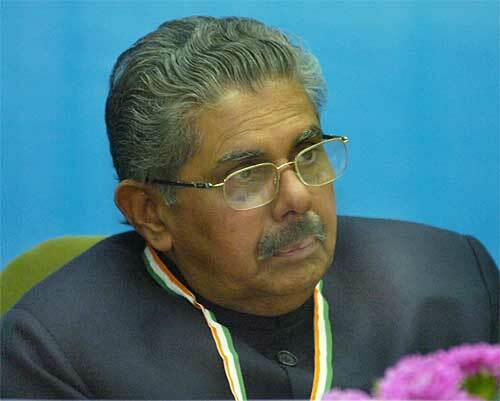 I have already stated that there will be no talks with the pilots till they are on strike," Civil Aviation Minister Vayalar Ravi has said. 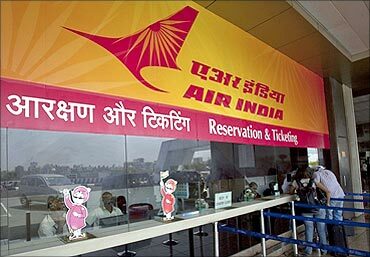 Image: Air India's ticketing counter. He has been regularly briefing Prime Minister Manmohan Singh on the daily developments relating to the situation arising out of the pilots strike and the high court proceedings. ICPA leaders have made it clear to the court that they would call off the strike as soon as the management gave an undertaking to consider their demands within a given time-frame. They have said that the Chief Labour Commissioner, in its closure report on the last round of tripartite talks, had blamed the management for not making any efforts to resolve the issues. They quoted the CLC's closure report on the conciliation proceedings as saying that the management had shown 'an insincere and superficial attitude towards reaching an amicable solution'. The pilots, who struck work from midnight last Tuesday, have been demanding pay parity with their colleagues of erstwhile Air India, better working conditions and CBI inquiry into alleged withdrawal of flights from profitable routes, aircraft purchase and other issues. India's fighter plane deal: All about business!